Inspire others to look up this holiday season by giving the gift of a telescope or astronomy binoculars! We've rounded up some of the best deals on Celestron products for sale on Amazon right now. 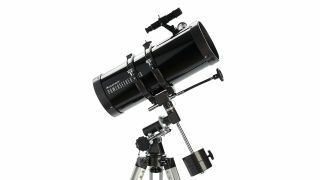 If you're looking to buy a new telescope but don't know where to start, check out our telescope guide pages to find the best options for beginners, hobbyists, kids, skywatchers on the move and anyone on a budget. And if you're looking for something more compact, check out our binoculars buying guide as well. If you're looking for awesome tech ideas, check out our sister site Tom's Guide for more Black Friday and Cyber Monday deals. Celestron 127EQ PowerSeeker Telescope: This top-selling telescope on Amazon was a huge hit in 2017 and it's back again this year. The PowerSeeker is designed to give first-time telescope users the perfect combination of quality, value, features and power for a bargain, with a sale price of $120 (compared to the usual $170). Celestron 114LCM Computerized Telescope: If you're looking for a telescope that automatically finds Mars, Jupiter or your favorite galaxy, this computerized 114 mm Newtonian from Celestron is the perfect choice. You can set it to find thousands of celestial objects with Celestron's NexStar+ handset and a simple SkyAlign alignment procedure that takes only minutes. It's SkyTour function even finds objects visible in your night sky to offer an easy target selection. Amazon has the telescope on sale for $250 (down from $300, though we've seen it listed as high as $375 in recent months). An optional Celestron NexYZ smartphone is available for the bundle price of $310. Celestron PowerSeeker 50 AZ Refractor Telescope: This smaller, affordable telescope is perfect for beginners taking their first look at the moon and planets, or for use on Earth to see distant vistas up close. It weighs just over 5 pounds and comes with a collapsible tripod, three different eyepieces (4mm, 12mm, and 20mm), a 3x Barlow lens to triple the power of each, and a 1.5x erecting eyepiece that will flip the targets in view so they are right side up. A downloadable astronomy software guide, with printable star charts and more is included. On Amazon, the PowerSeeker 50 AZ is on sale for $44 (down from $48), so it's only small markdown, but worth noting if you're not looking for a major telescope investment this year. Celestron 21024 FirstScope: A great telescope for beginners, Celestron's FirstScope is perfect for adults and kids looking to get a dazzling look at the moon and and planets for an affordable price. It's a Dobsonian telescope with a 76 mm reflector tube to collect light from the night sky. Take note: This is a tabletop telescope, so you'll need a table or other flat, stable surface for viewing. Amazon is selling this telescope at the usual retail price $50. Celestron SkyMaster Giant 15x70 Binoculars with Tripod Adapter: Telescopes aren't the only way to observe the night sky and Celestron's SkyMaster binoculars are one of our top picks for binoculars for astronomy. The feature a large 70 mm objective lens to maximize image brightness in low-light and stargazing conditions and come with a tripod adapter in case you get tired of holding them (they weigh just over 3 pounds). On Amazon, they are on sale for $58 (down from $73). Celestron Cometron 7x50 Binoculars: These small binoculars are handy for skywatchers on the go and feature a 50 mm objective lens and wide view observing area to see more of the night sky at once. They also include a large exit pupil to allow more light through during nighttime and low-light observing. On Amazon, they're on sale for $26 (down from $35). A smartphone adapter bundle is available for $44.